I don't want to let the passing of Yelena Bonner of heart failure a couple of days ago go unremarked. I learned much about her I didn't know from the various obituaries --some of it slightly contradictory. I knew her only as the brave pediatrician wife of Andrei Sakharov, which would be enough, but she has a really interesting biography on her own. Born into a family of Communist agitators who fell afoul of the Great Terror (her father was "disappeared" in a Soviet prison, and her mother, Ruth Bonner, spent 15 years in the Gulag); sent as a nurse to the Russian Front during WWII, where she was wounded often and received "top Soviet honors." In 1965, in spite of her family's experience, she joined the Communist party --a thing she later called the worst mistake of her life. By 1972 she'd left the Party, married Sakharov, had started a fund for the children of dissidents and was one of those who helped smuggle the diaries of another famous dissident, Edward Kuznetsov, into the West. It's because I remember this (more accurately, I remember Soviet dissidents talking about what it meant to them in the 80s; I was a little young to have been paying attention in 1975) that I so admired President Bush's insistence on meeting with dissidents and talking about human rights wherever he traveled and am so disheartened and disgusted by President Obama's refusal to do so. Nordlinger reveals that in her later years she became reconciled to Gorbachev's Nobel prize and came to respect him personally, but was disgusted with Yasser Arafat's (PLO thugs came armed to her house and threatened to kill her whole family in 1973), and indeed with the creeping anti-Semitism of the Nobel Committee. 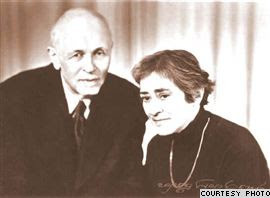 after Lusya and Sakharov had returned from internal exile in Gorki (now, Nizhny Novgorod), I called them (I was already working in Munich then) and she said: "Listen, while we were gone you left all your samizdat and copies of the 'Chronicle of Current Events' under our couch! What are we supposed to do? It is really uncomfortable when Andryusha wants to lie down." And in the background I could hear Sakharov laughing and brushing it off, saying it could wait. I loved Yelena Bonner — the best kind of fighter — and I’m grateful for her life.